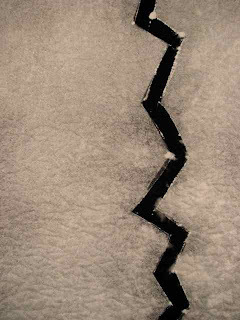 A detail shot of Clare Plug's quilt 'Icecrack 6'. Clare went to Antarctica a couple of years ago as a visiting artist and currently has a wonderful exhibition at Napier Museum which will travel to Manawatu, Christchurch and I think Auckland. Above shot is from Left to right - my quilt 'Irrigation', Cheryl Comfort's quilt 'Unless', Ronnie's quilt 'Changing Tides' and Jenny Bowker's quilt 'Hot Water, Dead Sea'. I've neglected the Blog whilst having a spot of surgery. I still get a bit dizzy if I sit up for too long so its been hard to keep up with email etc. We had a nice article about the 'Change in the Weather' show in last Saturday's (20th June) Dominion Post newspaper thanks to Ann Packer. 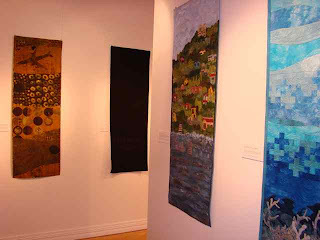 Here are some further photos of the quilts in the show.